From address for the test email: The personal email address of a sales rep.
Use a sufficiently large sample size. It’s tough to prove a hypothesis if your test sample size is small. The larger your sample size can be, the better your test results are. But you have to be careful. For this email example, if the sample size is too large, you risk having a large portion of your database receiving a less-effective email. You have to strike a balance right in the middle. Many factors can affect the results of your test, so try to eliminate variables that would render your test obsolete. For this example, you don’t just need to leave your control unchanged, but you also need to send your emails at the same time and make sure your test is randomized. If you’re using a marketing automation solution, you can usually conduct A/B testing quickly and efficiently by sending 50 percent of your emails to a random sample of your designated list. After you have sent out your test, wait to examine your results to prove or disprove your hypothesis. First, you need to look to determine if a statistical significance — the probability that results are meaningful and not because of chance — exists between your two versions. 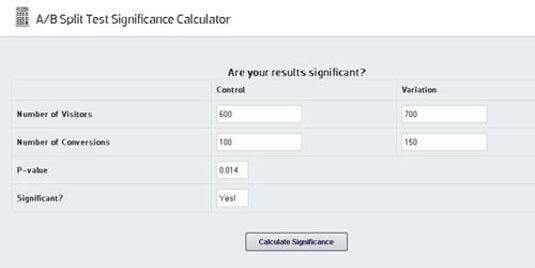 Use an A/B testing significance calculator (one from Visual Website Optimizer appears in the image). You input the number of visitors for both the control and the variation, as well as the number of conversions. And then you can calculate the significance. You can also use calculators to determine the confidence score, so you know just how significant your test is. A 95 percent or more confidence score is where you want to be to know your test is significant. Back to the From name test. The personalized From name had 1,000 more opens and 500 more clicks than the control name. The confidence score was 99 percent. And because only one factor was isolated, it was clear why the email with the personalized From name received more clicks. Next, you optimize your campaigns based off of your test results. This should be fairly simple and straightforward if you’re always testing (which is highly suggested). Take your results and implement them!